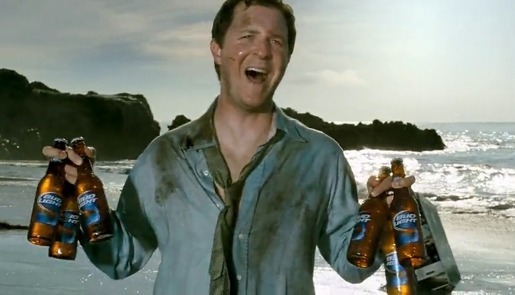 Bud Light is provided with a tie-in with the ABC television series Lost in “Stranded”, a television commercial aired at the 2010 Super Bowl. A woman walks into the beach from the crashed plane to tell the stranded passengers and crew that she’s found the plane’s radio equipment. But the thought of getting off the island is totally overlooked as another passenger announces the discovery of the plane’s fridge, full of Bud Light. The Stranded ad was developed at Cannonball, St Louis, by creative director Steve Hunt, creative director/art director Mike Binnette, copywriter Brian Fauss, producer Johnny Chambers, broadcast production manager Mary Jarnagin, account director Cori Wilson, account director Cori Wilson. Filming was shot by director Craig Gillespie via MJZ with director of photography Janusz Kaminski, executive producer David Zander and line producer Martha Davis. Editor was Griff Henderson at School Editing. Sound and music were produced at Pirate Toronto by director Vanya Drakul and producer Joanne Uyeyama. Casting director was Cathi Carlton.